Does the cold weather have you feeling a bit blue? Say, because you’re chilly? Well there are multiple solutions for you to keep your bottom half warm and have fun out in the cold! I decided to try out the WeatherPro tights from Shebeest to add to my collection of winter tights available for me to wear during the cooler months. A fatbike in my future means that I will have opportunity to ride my bike more than just to work and back, so I wanted to have a third option at my avail. You will find that having attire for the winter will mean more than just one particular pair of something or other. You will find yourself possibly acquiring a collection of winter weather apparel to suit multiple conditions, such as windproof tights, thicker tights, etc. 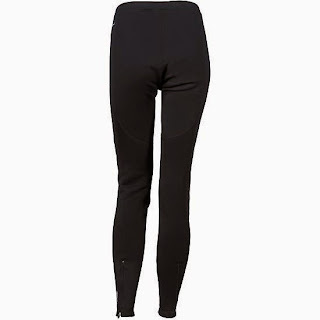 The Shebeest WeatherPro tights are to be worn over your favorite pair of riding shorts. They are chamois-free, which means you can wear whatever bottom makes you most comfortable. Also? Rather than wearing a liner short, on the colder days you can wear a more substantial short or perhaps a pair of tights with a built in liner for extra protection from the cold. The tights are not completely next-to-skin. I find I have ample room to move and since you can tighten the mid-section with a drawstring, one could easily have a thin layer of something under the tights themselves without being too uncomfortable or bunchy. On the front of the legs they use Wind-blocking SheNook Fleece and stretchy VeloWARM fabric on the back of the legs to keep the bulk down and allow good range of motion. 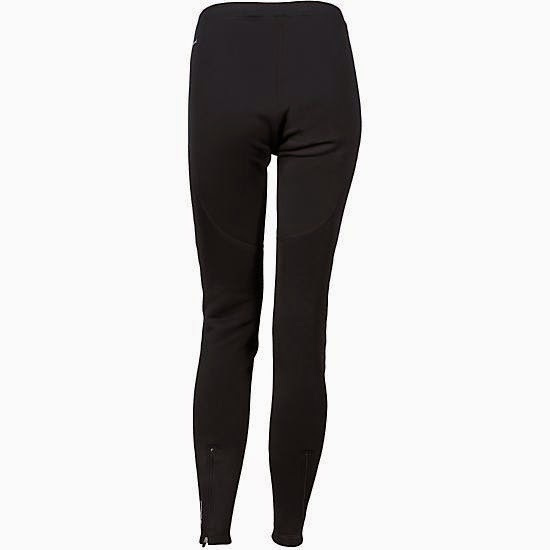 These tights can be used for cross-training such as running, snowshoeing, hiking, etc. The SheNook Fleece is said to have a highly wind resistant exterior with a velvety soft interior. It’s breathable with excellent moisture wicking properties. The VeloWARM fabric has a body hugging, 4-way stretch for range of motion and a warm, soft fleece interior for warmth. My first ride(s) with these tights were on a day after we got our first dusting of snow. Starting out in the upper 20’s and inching into the low 30’s these tights were worn for two rides that day. On the first ride when it was cooler, I have no problems at all with being overly chilly. I ended up slipping out while riding and landed on the trail, quickly brushing off the snow so it wouldn’t soak through. I didn’t feel any residual moisture and the tights were unscathed-I really love purchasing items that are durable and can handle a few tumbles. I had a couple hours between rides, and was happy to find that the waist band area was dry prior to donning the tights a second time. I really wanted to give these tights a go, and going out later in the afternoon would prove just that! The second ride was a couple hours at the very least, and went into the late afternoon/early evening hours when temps start to drop. Not once during the ride did I feel uncomfortably chilly, and honestly? I felt pretty darn good on my lower half. I had a couple more falls during this ride (because trails were a bit slimy and/or the joys of riding a bike I’m not familiar with.) and had no issues with the tights becoming really dirty or tearing. Both rides had a good amount of wind on my ride home, and on both rides I did not feel unbearable when riding back into town. Honestly? I felt comfortable and I didn’t feel like the wind cut through my tights. I remember feeling happy that my knees didn’t feel chilly-which is something one likes to try and keep at bay. I tried out the tights a few days later with the Shebeest Pedal Pusher Capri tights on underneath. I had long, wool socks that covered up the ankle area, so there wasn’t an inch of skin without some sort of coverage. The temp was around 25 degrees but had a chill closer to 14. I must say, I might’ve been a wee bit too warm at times. I eventually regulated myself when I’d make it out of the tree cover and the breeze would hit. Overall I was very comfortable and I had ample room to wear the tights over something other than a liner short. 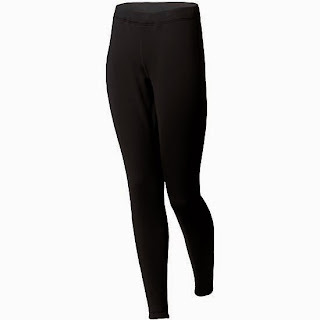 I would definitely recommend a pair of WeatherPro tights to add to your winter weather gear. They are a great product, so far have kept me very comfortable, and you can layer under them relatively easily. The calves zipped up over my thick wool socks-awesome! I also didn’t feel like a sausage with two layers on my lower half. I would say that these are not the “cure all” tights-I would want something with even more wind-proofing if it were really blustery out. Let's be honest. You can't ride all winter with just one pair of tights because weather conditions change and there are times where you need extra protection, moisture-proof fabric, etc. I’m not a fan of the cold months, but I’m not going to let temperatures deter me from riding my bike. Get the clothes that will help you enjoy spending time outside this winter season, it’s so worth it!